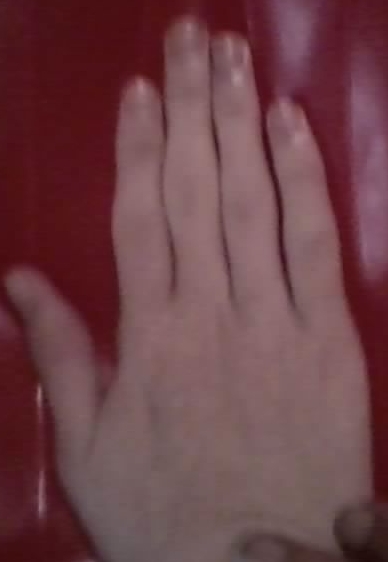 Low 2D:4D finger ratio: a confirmed hand sign in Autism! Over the past decade quite a few studies have been presented which all confirmed that a low 2D:4D finger ratio is a hand sign that is typically seen in autism (autistic spectrum disorder). These studies have indicated that autistic people often have a (average) digit ratio that is clearly below the (average) digit ratio in controls. And Manning's 2001 study has shown that the digit ratio in autistic people is typically also the (average) digit ratio in family members - where the parents of autistic people (especially the father) tends to have a (average) digit ratio that is slightly below average values. Re: Low 2D:4D finger ratio: a confirmed hand sign in Autism! This is right that differences in finger length ratio between males 'may' indicate autism, with spreading developmental disorder and anxiety disorders, but, this cannot be sure or confirmed hand sign for autism. Researchers have also found that a longer ring finger makes a person attractive. If ring finger is longer than index finger will be smaller. I want to know how a person at a time can be attractive, vivid, shiny, promising and suffer from autism too? Yes, the hand would have to be analyzed in totality then. 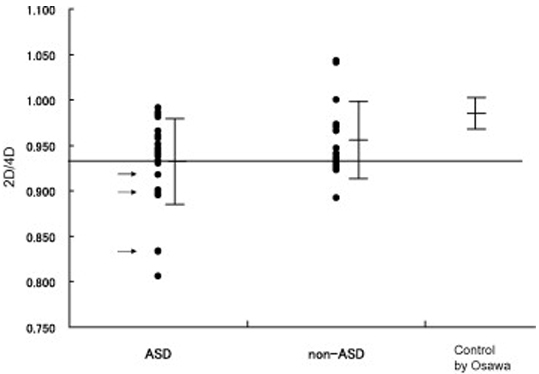 But, we cannot say with surety that Children with autism have a relatively shorter index finger (2D) compared with their ring finger (4D) definitely. This will be IMPROPER and will create doubts in freshers. It will be PROPER to say that low 2D:4D ratio ‘MAY’ serve as one possible marker of autism. This is clearly mentioned there at the link mentioned below. I KNOW MANY MANY PEOPLE WHO HAVE SHORT INDEX FINGER AND NOT SUFFERING FROM AUTISM AT ALL. I think you will agree with me that this is not a confirmed hand sign of autism. I only used the word 'confirmed' to highlighten the fact that many studies around the world have confirmed that a low 2D:4D digit ratio is usually found in autism. "But, we cannot say with surety that Children with autism have a relatively shorter index finger (2D) compared with their ring finger (4D) definitely." However, your words appear to suggest that I made such claims by using the word 'confirmed', but now that I have explained why I used the word 'confirmed'... I can only hope that you will now recognize that you misinterpretated my use of the that word. Because, if you re-read my first post properly... you should notice that I never suggested that it is a 'sure' indicator for autism. 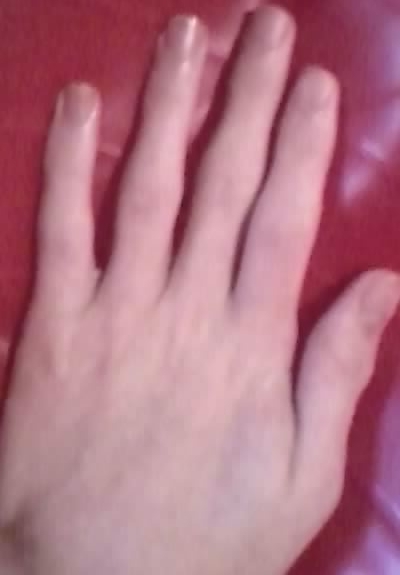 "Researchers have also found that a longer ring finger makes a person attractive. If ring finger is longer than index finger will be smaller. I want to know how a person at a time can be attractive, vivid, shiny, promising and suffer from autism too? Yes, the hand would have to be analyzed in totality then." True, that is a valid question! The answer is that this can be understood by focussing on how the hormone 'testosterone' can manifest in various types of behavior... including various positive types of behavior (like for example: assertiveness & enthousiasm)... plus various less-positive types of behavior (like for example: autism & agression). So, yes you are right again... one can not 'interpretate' any manifestation of the 2D:4D digit ratio without considering other aspects of the hand. But the 2D:4D digit ratio is for sure a key-element in understanding how autism manifests via the hand - though (having said that) this does not implicates that all people with autistic spectrum disorders have a low 2D:4D digit ratio... but for sure: a large majority of them do have this hand characteristic. Anyway... Parender, thanks for responding + sharing your thoughts & questions!! Parender said.. "Researchers have also found that a longer ring finger makes a person attractive. If ring finger is longer than index finger will be smaller. I want to know how a person at a time can be attractive, vivid, shiny, promising and suffer from autism too? Yes, the hand would have to be analyzed in totality then." Is it attractiveness, based on sexual attraction or is it simply being an attractive person that you are referring to? The reason I ask is because I have found that the autistic people that I have met to be attractive in the sense that I look past their social faults to the pureness of their self. I find it completely refreshing to be around someone is isn't caught up in how they appear to others. Now, my experience with people with Autism has been with more of the functioning Autistic variety. Not everyone shares my views on this, maybe subconsciously they are attractive for being themselves. They say the longer a man's fourth or ring finger is compared to his index finger, the more likely he is to be judged attractive by women, according to a new study. But, I think an attractive person is first of all pleasing to the eyes or mind in first place through beauty or charm who has attractive personality. For example you can say like attractive clothes or attractive book or book cover or attractive illustrations. Your job is attractive because of your pay. A person who has the properties of a magnet; can say who has the ability to draw or pull. Like me! Ha ha ha! And autism means (psychiatry) an abnormal absorption with the self; marked by communication disorders and short attention span and inability to treat others as people. This is quite contrary to attractiveness. Obviously, you may be right in this regard because no sign on the palms of the hands is absolute in itself. It will depend on person particular. "No differences between autistics and controls were found for height, middle finger length, hand palm length, hand length and foot length." However... unfortunately the report does not present any info related to 'hand breadth', so regarding hand shape the study only reports info on the aspect of 'finger length versus palm length' (and both elements in isolation). So, regarding hand morphology one should better focuss on the typical features that are often found in the fingers - such as: low 2D:4D digit ratio and/or short 5th finger with clinodactyly.